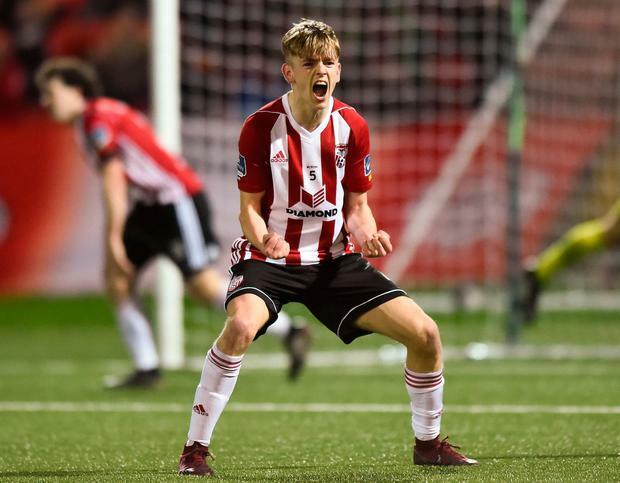 Derry City held on to see off Waterford at the end of a thrilling encounter at the Brandywell last night as two own goals proved to be the visitors' downfall. The game swung back in Derry's favour with just 15 minutes remaining when Patrick McClean's sensational cross from the left was put into his own net by Rory Feely. Five minutes from the end Derry benefited from another own goal, Harkin's cross turned into his own net by Georgie Poynton. But Waterford ensured a nervy finale when Cory Galvin found the net from 30 yards. DERRY CITY - Cherrie, Cole, Toal, Gilchrist, McClean, Sloggett, Harkin (Bruna 87')McNamee, McCrudden (Delap 70') Parkhouse, Ogedi-Uzokwe. Waterford - Connor, Feely, Lynch (Poynton 30'), Duggan, Browne, Lunney, Drinan ( Akinade 63') Twine (Galvin 57'), Elbouzedi, Delaney, Hery.